A new generation of gaming with enhanced graphics and social features. The Dualshock controller has been redesigned and enhanced for a more comfortable and responsive gameplay experience. Play all-new games like DriveClub, Until Dawn, No Man's Sky and The Division or play new takes on fan favourites like Killzone, Fallout 4, Assassin’s Creed and Battlefield. Unlock the PlayStation Vita’s hidden potential by using it for Remote Play on PlayStation 4! See the content that’ll interest you as the PlayStation 4 learns what you like and play and displays content from the PlayStation Store relevant to you. 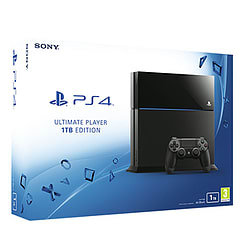 Please Note: GAME cannot ship the PlayStation 4 1TB console outside of the UK. Experience unrivalled graphics performance, the biggest blockbusters and the best exclusive games and additional content – all on the world’s most powerful console. Now you can download twice as much thanks to 1TB of built-in storage. Head to PlayStation Store and download more of the greatest games to your PS4. Extend your gameplay with more unmissable add-on content. And save and share even more of your best gaming highlights. PlayStation 4 will allow you to experience dynamic and connected gaming, fuelled by powerful graphics and speed that is woven into a social and customisable landscape that expands the enjoyment with a second screen. Combining unparalleled content, immersive gaming experiences, all of your favourite digital entertainment apps, and PlayStation exclusives, PS4 centres on gamers, enabling them to play when, where and how they want. PS4 enables the greatest game developers in the world to unlock their creativity and push the boundaries of play through a system that is tuned specifically to their needs. You, the gamer, are the focal point of the PS4 system, ensuring that the very best games and the most immersive experiences are possible on the platform. The PS4 system enables the greatest game developers in the world to unlock their creativity and push the boundaries of play through a system that is tuned specifically to their needs and deliver the best possible gaming experience to you. The PS4 system is centred around a powerful custom chip that contains eight x86-64 cores and a state of the art 1.84 TFLOPS graphics processor with 8 GB of ultra-fast GDDR5 unified system memory, easing game creation and increasing the richness of content achievable on the platform. The end result is new games with rich, high-fidelity graphics and deeply immersive experiences. As you play, browse the PlayStation Store and interact with the PS4, the system has the ability to learn about your preferences. It will learn your likes and dislikes, allowing it to surface more of the content you like and pre-load it, ready to go on your console from your favourite game genres to your favourite creators. Players also can look over game-related information shared by friends, view friends’ gameplay with ease, or obtain information about recommended content, including games, TV shows and movies. DUALSHOCK 4 features new innovations to deliver more immersive gaming experiences. From Its definitive analog sticks and trigger buttons have been improved for greater feel and sensitivity to including a highly sensitive six-axis sensor as well as a touch pad located on the top of the controller, the Dualshock 4 offers gamers completely new ways to play and interact with games. Remote Play on the PS4 system fully unlocks the PlayStation Vita system’s potential, making it the ultimate companion device. With the PS Vita system, gamers will be able to seamlessly play a range of PS4 titles on the beautiful 5-inch display and dual analog sticks over Wi-Fi access points in a local area network. PlayStation Plus gives you exclusive access to a diverse range of immersive online multiplayer experiences to suit all players' tastes, from Killzone Shadow Fall to DriveClub, Watch_Dogs and Battlefield 4. Play and chat with your friends and a community of like-minded gamers from all over the world who love the same games as you do. One payment gives you access to PlayStation Plus on your PlayStation 4, PlayStation 3 and PlayStation Vita systems, so current members on PlayStation 3 or PlayStation Vita can carry their subscription over to PS4 or use it across all their systems at no additional cost.